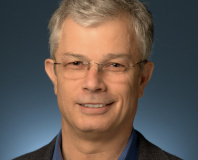 Dadi Perlmutter, Executive Vice President and General Manager of Intel’s Mobility Group, announced that Intel has launched its first mobile quad-core processors based on the company’s 45nm Penryn architecture during his keynote. The first processors will be the Core 2 Extreme QX9300 and Core 2 Quad Q9100 and will come clocked at 2.53GHz and 2.26GHz respectively. 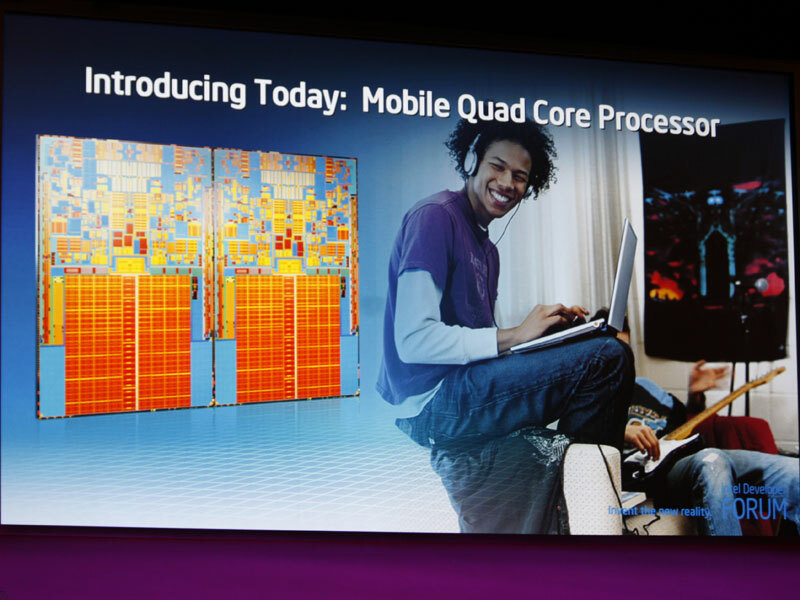 Both feature a 1,066MHz front side bus and 12MB of L2 cache. 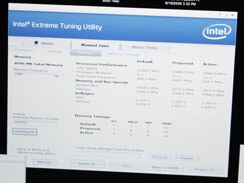 TDPs haven’t been discussed openly, but we’ve heard whispers in the region of 55W – one thing’s for sure, you won’t be seeing these processors in anything but desktop replacements. 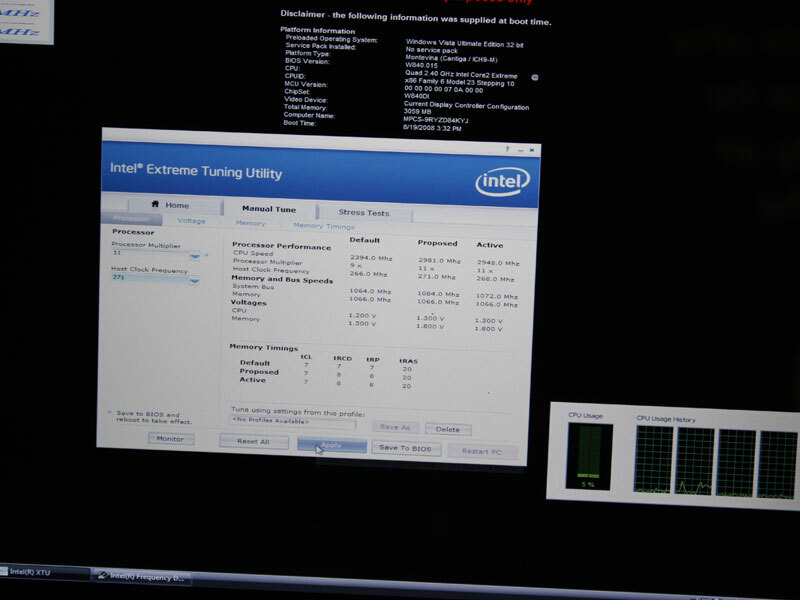 We’ve seen a couple of machines with mobile quad-core processors dotted around the Moscone, but none seem to be using processors clocked at the launch speeds. One was an Asus model with a 15.1in form factor, which looks like it’ll fit under the Republic of Gamers brand. 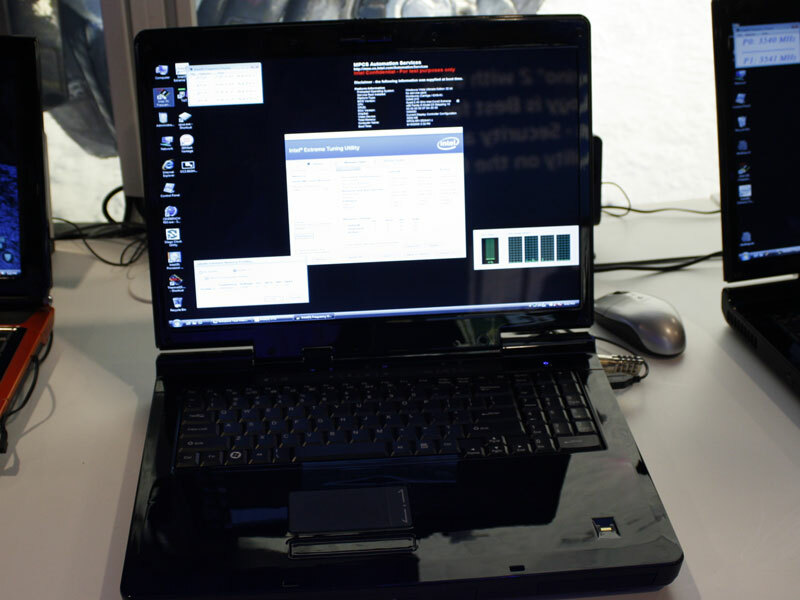 The other was a 17in ODM model from Flextronics, which featured a mobile Core 2 Quad processor rated at 2.4GHz, but running at almost 3.0GHz. In addition, the machine also included a pair of Mobility Radeon HD 3870s in CrossFire for good measure. 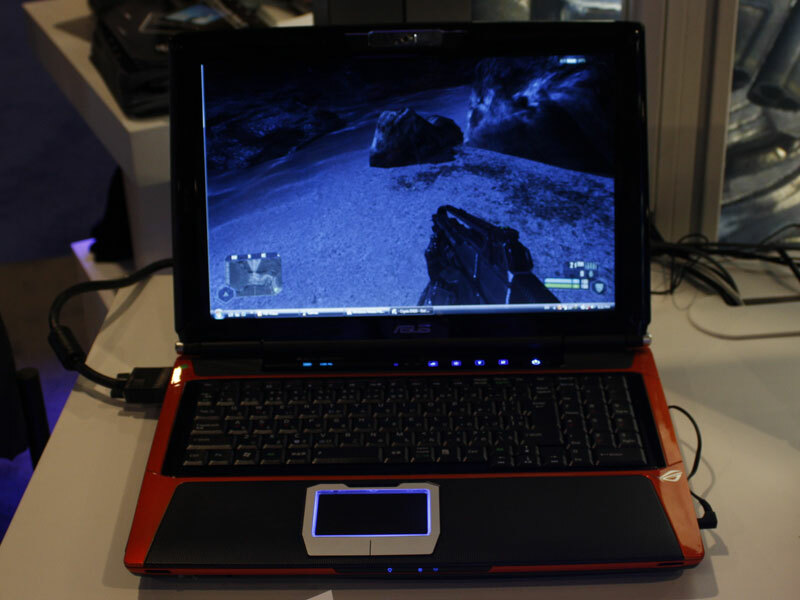 Opinion on gaming notebooks in general is divided, but these two machines look like they might satisfy that niche of performance-craving mobile gamers and multimedia enthusiasts. 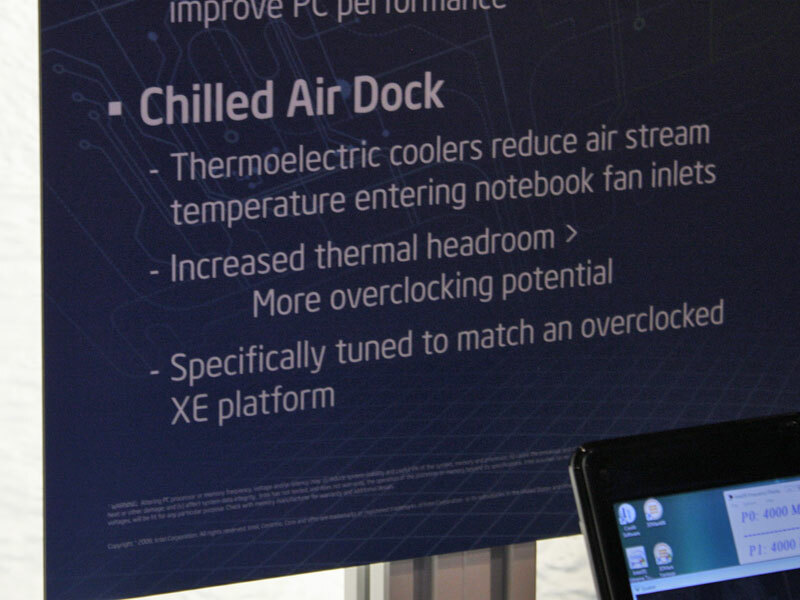 I’m not entirely convinced by this whole overclocked gaming notebook market though – overclocking notebooks just doesn’t seem right. That concern was amplified when I saw a mobile dual-core desktop replacement notebook running at an impressive 4.0GHz. 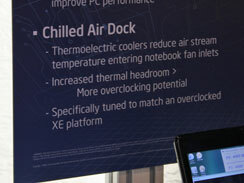 In order to reach these speeds though, the notebook had to be cooled by a thermoelectrically chilled notebook cooler. Without that, you’d be limited to a 3.5GHz clock speed “before things get a little unstable,” said one Intel representative. 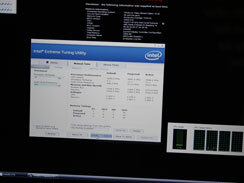 Moving back to the quad-core processors being announced though, I see them having a bigger impact in the mobile workstation market – a market where overclocking isn’t even a consideration. We look forward to having a look at some of the notebooks once they’re available – they won’t be the first though, because Kobalt has already shoehorned a desktop quad-core processor into a ‘notebook’ with the Comanche SLI. 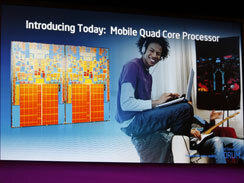 What do you think about quad-core making a move into the notebook arena? Discuss in the forums.